Release Date: 2002 Running Time: 130 mins. A truth-based thriller that weaves a riveting tale of moral and religious conflict from Oscar-winning director Costa-Gavras, Amen is the story of an SS officer who fought to stop Hitler’s genocide. Lieutenant Kurt Gerstein was a chemist who ordered Zyklon B to purify the German water supply; when he found it was being used to gas Jews and Gypsies, he determined to make it stop. “If it costs 15,000 marks to build one house for a working class family,” Gerstein’s young daughter reads steadily from her math book, “and it costs six million marks to build one insane asylum, how many working class houses can you build for the cost of one insane asylum?” In Nazi Germany even elementary school textbooks were used as a tool to brainwash society into seeing the utility of eliminating people for economic efficiency. With no notable Jewish characters, Amen offers a rare perspective on the Holocaust, focusing instead on the behind-the-scenes diplomacy that allowed the genocide to happen. Avoiding the imagery of starving inmates and gruesome lineups so common in Holocaust movies, Amen is, at bottom, the tale of two gentiles, miffed by politics and bureaucracy, working their hardest and risking their lives to save the Jews. Costa-Gavras’s penetrating lens follows Gerstein as he discovers a mentally ill relative’s extermination by the Nazis. Gerstein entreated Pope Pius XII to declare outrage. But when the killing turned to Jews and Gypsies, the Catholic Church stopped protesting, and stopped listening to Gerstein’s pleas for intervention in the mass exterminations. Appointed the Head of Technical Disinfection Services to the SS, Gerstein was an eyewitness to the horrors of the gas chambers, and went on to write the Gerstein Report, a detailed account of his service and efforts to stop the exterminations, which has been instrumental in authenticating the Holocaust and was the basis for the events depicted in Amen. Visually rich and dynamic, the film asks thought-provoking questions about loyalty, martyrdom, and the power of individuals to make a difference. Amen attempts to solve what is perhaps the greatest mystery of the Holocaust: the silence that surrounded it. When the Nazis realize that Gerstein is a chemical genius and probably the German most familiar with the prussic acid used at the death camps, they call upon him to help figure out how to gas Jews more efficiently. Gerstein, a devout Protestant of almost unbelievable moral uprightness, is horrified to learn that rumors of Nazi genocide are true. Gerstein must decide whether to resign from the SS — losing every chance of using his power to stop the injustice — or try to stop the genocide from the inside, which would mean working to make the killing machine more efficient at the same time as he’s trying to bring it to a halt. Amen condemns the Catholic Church for its silence while the genocide of the Jews occurred. 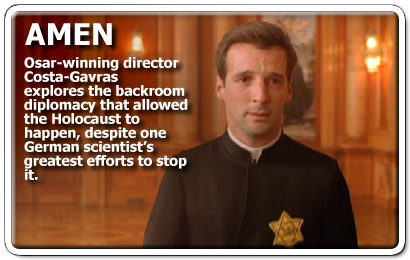 In its opening scenes, Amen points to the hypocrisy of the Church’s stance against Nazi killing of the disabled in comparison with its inaction regarding the Jews. The local cardinal turns a deaf ear to Gerstein’s accounts of the death at the camps. Only Riccardo Fontana, the cardinal’s footman, will listen. “I feel guilty as a spectator, even more so as a priest,” Fontana tells his father, and joins with Gerstein. Together, the two idealists embark on a mission of justice, each man using his own influence and leverage to try to effect change. Amen raises a number of difficult moral questions, not least of which is whether Gerstein did the right thing by remaining in the SS to fight from the inside. As another SS officer surmises, “Your god will have a really hard time with you, Gerstein.” While it may not offer a settling answer to the silence that surrounded the events of World War II, Amen opens the door to rethinking the actions of influential Germans during the Holocaust.